In thinking about what I would write so as to update all my friends and followers, I wanted to publish a blog post entitled “The Myth of the Super Pastor.” After I was two pages in, I realized that would need to be a subject I dealt with in detail at a later time. So, instead, I am going to share with all of you what is going on in my life concerning my upcoming surgery. This is the moment when I step out from behind the curtain and become vulnerable not just to a few close friends and family but to all of those who have followed me over the years. Beginning in the middle of 2015, my lower back has caused me a great deal of pain. At first I thought it was kidney stones so, at the beginning of 2016, the doctor ordered some x-rays and eventually an MRI. They did find a kidney stone and when they surgically tried to remove it they discovered I had already passed it. I thought this would be the end of it but shortly after our move in the summer of 2016, I began to have even greater pain in my lower back. I waited until our new insurance kicked in and went to the doctor in September. She checked me out, ordered an MRI, and recommended me to a specialist. It took almost two months to get in to see him by which time I was having serious pain in my neck and right arm. My “consultation” lasted all of ten minutes before he said I needed another test and I would be seeing a different specialist. It took another few weeks to get in and by that time I had found I couldn’t stand for more than 10-15 minutes at a time and my right arm was steadily losing mobility while also increasing in pain. The pain, at this time, is fairly constant and no pain killers seem to be working. While it looks a bit frightening, I’m hoping for the best. I have spoken with others online who have had this surgery and they’ve told me the pain relief is almost immediate. The doctor, of course, has told me that may or may not happen as quickly as it has for others yet I’m maintaining as positive an attitude as possible. Of course, there are difficult days ahead. I’m having surgery just when we are beginning a new direction for the church I am pastoring. We are also working out how our son will be picked up from school when he goes back the week following my surgery. While I could travel across the state and have the surgery at a Methodist hospital where the cost would be significantly less, it would create a significant delay in my treatment and having proper after care while living four hours away from any attending physician would be a huge challenge for our family. This means we will have a pretty big hospital bill since our deductibles will once again reset on January 1. Since we are still paying the co-pays on two MRI’s and a Cat Scan from 2017, we are still trying to find ways to fit this into our limited budget. The surgery will be this Friday, January 5, which for those of us who follow the liturgical year, is the last day of Christmas. My hope is this will be a wonderful final Christmas present which will lead me into a better New Year. Of course, the doctor has also mentioned I may also need knee surgery in 2018. It seems those years of moving lots of furniture, appliances, and heavy big screen televisions has finally caught up with me. Please keep my wife, our family, and the church I am serving in your prayers. While this will be a personally trying time for me, it is also going to be difficult for my family and this fledgling congregation. On a geeky note, I’m upset they don’t have nanites to use in this procedure nor will they be able to turn me into a cyborg. Our robotic overlords have failed me. It was my way of telling her I was going to miss her so very much until I saw her again. However, when I sang this song to her, I always knew it wouldn’t be very long before we were together again so this was just a sweet way to end the evening. Now, as Jennifer, Laurel, Arthur, and I are preparing to move from Trenton these lyrics keep running through my mind over and over as I think about the two churches I have been serving here. I really do hate to leave but I must. This is part of my calling as United Methodist pastor and, I believe, in some mysterious way, God uses the Bishop and the Cabinet to help lead us into the places we need to be. I have come to realize during my time as a United Methodist pastor serving the church is not about where I want to be but, rather, it’s about where I need to be. Along the same lines, United Methodist Churches often “want” a certain type of pastor but that may not be the type of pastor that particular Church needs. I can honestly say, now, looking back over the last four years that Trenton, TN is the place I needed to be. It has been a beautiful and enriching experience for my family and I and we have encountered more rich, Christ filled relationships than we could ever have imagined. Together we have celebrated weddings, the birth of children, their baptisms, confirmations, and so many other wonderful times. Together we have also wept over the loss of loved ones and the pain of illness. And, together, we have worshipped the resurrected Christ and celebrated the new life He grants to all of creation. It is my hope and belief the Spirit of Christ will continue to form the people of Trenton and Olive Branch into the welcoming and open community we have experienced during our time here. May this same Spirit empower all of you into exciting and wonderfully new avenues of ministry. 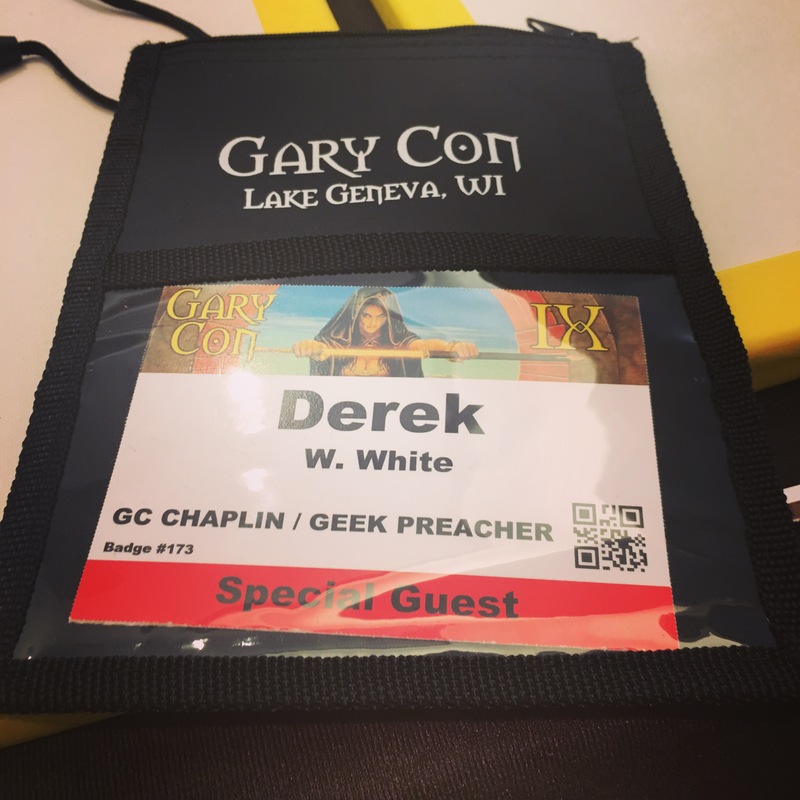 I’ve been serving as an unofficial chaplain and behind the scenes volunteer for the past few years but this year Luke Gygax made it official. It was a strange feeling and, honestly, I was a little nervous. Considering the strained relationship gamers have had with the church, I wasn’t sure how people would react. I’ll say, so far, the responses have been overwhelmingly positive. This leads to my next stand out moment. I sometimes have trouble sharing moments like these because they can fall into the “toot your own horn” category but, as you’ll see, there is a reason for it. On the first day of Gary Con, a friend I’ve come to know over the past few years came up to me and said he needed to talk. He was facing some turmoil with work and, after he shared with me, I asked if I could pray with him. He was amenable and we prayed. A day or so later he came up to me and shared something I’d not known. He said, “Derek, you’re the reason I’ve become more open about my faith.” I was, to say the least, shocked. I had not expected to have had such an impact on someone and, honestly, I didn’t think he had been closed off about sharing his faith. Now, you have to understand. My friend wasn’t ashamed of Jesus or faith. He simply wasn’t open about it because of the negative way in which many Christians have historically approached our geek/gaming community. Many in the gaming community remember the hurt brought upon them by the church but we often do not realize the pain those who remained in the church bore as well. They carried the pain of the gaming stigma within the the church and many had their commitment to Christ questioned because of it. However, they also bore the stigma of “Christian” when around their friends in the gaming community. They found themselves hiding their true identity from both of the communities which they deeply loved and this led to a deeper amount of pain. Many of these Christian gamers still live in doubt and fear wondering if they can truly be both. That’s where people like me come in. When my friend shared this with me, I realized something which has been bubbling under the surface for years. It seems a major part of my calling to this community is to those Christians who have been hurt by the church. Over the last decade, I have heard too many stories about how churches turned away and/or shamed Christian gamers and their friends. As a Christian, I’m called to let the love of Christ shine from my heart to those outside the faith but I’m also called to let it shine to my brothers and sisters in Christ. This light is to be an encouragement to them so they to might be beacons of God’s love as well. But this isn’t just my calling….this is the calling of all Christians. I’ll close on this final note. On Sunday, we had our Love Feast and it was a time of friendship and sharing. While this service was an interfaith service, I could tell many wanted something a little more. Therefore, I think next year I may be having a short worship service on Sunday while, on Saturday, having “table time” with anyone who wants to come. Oh, one last thing. Also on Sunday while I was standing outside HQ a man walked up to me and asked if I would give his daughter a blessing. He mentioned he had adopted her and wondered if I would do this for him. While I’ve baptized more than a few infants, I’d never been asked this before. I was both humbled and honored. I stumbled through that blessing but, tonight, I will remember that little girl in my prayers. It’s moments like this that truly make it all worth it. It has been many years since I’ve read Surprised by Joy and, honestly, I remember little from it beyond the title. I find that unusual as I am a lover of the works of CS Lewis and am able to, at least in passing, refer to most of his books straight from memory. In many instances, I can direct you to the chapter or section I’ve been discussing so it’s unusual for me to not be able to do so with this book. Yet this title remains with me and has, of late, been singing to my heart and I find that surprising. You see, in the course of my life, joy is an emotion with which I am intimately familiar. I have known the simple joys of having someone treat me to a wonderful meal to the complex joy of a new and exciting faith experience. I have experienced the joy of love and marriage, the joy of seeing my children born and watching them grow, and, of course, the joy of a few good friends. While I may have found these joys unexpected or unusual at the time I cannot say I have been surprised by the majority of them. Yes, when I was new to the faith, I was surprised by that particular experience and the joy which accompanied it. This was something I had never observed in my family and it was not a part of my life growing up so when this occurred in my own life I must say I was both surprised and astounded. I did not expect so much joy from encountering the forgiving love of Jesus so, yes, I was surprised by it. However, the joys of a wife, children, extended family, and good friends were not surprising to me. These are things which are common to most people (at least that is what we are told) and I would have been surprised if I had not experienced them! Yes, I realize there are many who go through life and never experience these joys but, as I grew up, I was taught to expect them as a natural part of life. Our books, songs, movies, and most everything else in our culture tells us we are to expect them. This means, sadly, these joys are often taken for granted. It also means there are many people who feel as if something is wrong with them if they do not experience these joys for themselves. If I tried, I could probably write a book on those joys which we take for granted or the depression that arises when expected joys never seem to arrive. However, that’s not what I wanted to write about this evening. Tonight, after everyone else has gone to bed, I find myself wanting to write about the joy which has surprised me so very recently. The best way to describe this joy is a sense of calmness which has come over me. It is a calmness I have not felt in a long time and, even in the midst of my own sins and failures, this joy is present. The reason this joy has surprised me to such a degree is that, when I really think about it, it should not be happening! Since early 2016 my life and that of my family has been filled with a lot of chaos. Some of it is the normal, everyday chaos of being a father and a pastor but some of it has “gone above and beyond the call of duty.” Early last Spring our son was formally diagnosed as being autistic. For me, this was a bit of a blow as I was not sure how to process it. Unlike my wife, I understood little about autism at that time so I began to spend more and more time studying it. Some of the reading had me rather depressed and left me in a bit of a funk for some time. Then, this fall, I suddenly found myself with back-to-back sinus infections as well as what I’ve come to find out is a kidney stone which doesn’t seem to want to pass. In the midst of all of this, and a few weeks before Thanksgiving, my father became even more ill and then passed away a few days before Thanksgiving Day. Needless to say, this was all quite overwhelming as the Christmas season is a busy time for a full-time pastor. Yet, in the midst of all of this chaos, over the past week or so I have found myself strangely surprised by joy. Some of the surprising parts actually occurred earlier in 2016 and they arose as my father began to share things with me he had never shared before. This led me to understand better why he was not so very supportive of his own children. Dad shared with me something he had never shared with me over the course of my life and, in doing so, was able to help me have clearer insight into why he was the way he was….and the answer was simpler than I expected: His father had never been supportive of him. It was in the midst of Dad’s sharing, I believe I began to love my father a bit more deeply. No, I couldn’t forget all the things he had done over the years nor the people he had wittingly and unwittingly hurt. Those wounds are still present yet I began to see the source of that which had damaged him and it gave me clearer insight into my own wounds. It was also during this time my father and I began to talk about faith and religion a bit more. While my dad always remained somewhat “all over the place” he seemed pleased to take communion with my family and me. This is something I never quite expected to happen and it allowed us to bond even more. Sharing the bread and the cup with my father has now become a cherished memory and, yes, the joy from it surprises me. Now, as I head toward Baptism of the Lord Sunday, I have learned to take a deep breath and relax. I sit here in my recliner wondering how things are going to go with this kidney stone. The idea of surgery always makes me a bit nervous yet, for some reason, I find myself surrounded my a calm joy and, yes, it surprises me. I feel as if my work is piling up on me and I’m not as present for others as I need to be yet I don’t feel weighed down by it. I hope in 2017 all of you find yourselves surprised by joy. It’s after 4 AM and I’m wide awake. It’s not a good thing for a guy with a sleeping disorder to be awake like this but, hopefully, I’ll be able to catch up on it later today. Since I’m awake and I have just seen the results of the United States Presidential Election, I believe it is time for me to organize my thoughts and communicate them with a pastor/preacher’s heart. You see, no matter what happens in my life, in my deepest being I will always be a preacher. I may love philosophy, history, and strategy games yet, at the very core of my being, I am someone who believes they have been called by God to share the Good News of Jesus Christ. So, what does this have to do with the election of Donald Trump as President of the United States? Well, to answer that question you have to understand what I believe to be the essential kerygma (or proclamation) of the Christian faith to be. Over two thousand years ago, God’s Age of Change and Fulfillment came into being through the birth, life, death, and resurrection of Jesus Christ and it has been growing throughout the world since that time. (Acts 2) The world is progressing more and more toward ultimate fulfillment and, while it may not always seem like it, the Kingdom of God is growing in this world in both obvious and not so obvious ways. This is Good News. Love God. Love Neighbor. Everything else will shake itself into place. The concept of neighbor is further elaborated on by Jesus when He describes one’s neighbor as someone who is both culturally and religiously different yet commits acts of kindness and mercy. One’s neighbor may or may not live close to you but they will be found in the hearts of both the native and the foreigner, the friend and the enemy. Now, how does all of this fit in with what appears to be a worldwide reaction to globalism and the loss of local and national cultural identities? It seems the European issues with Brexit along with the election of Donald Trump in the United States is a response showing humanity’s innate fear of the disappearance of these tribal distinctives. Please understand, I do not blame Donald Trump, Vladimir Putin, nor leaders who supported Brexit in the UK. These leaders are not the problem. They just happen to be people who are really good at understanding the spirit of this age and this zeitgeist has many people retreating into a local tribalism which rejects and repudiates Jesus’ concept of the universal neighbor. How do I respond to the spirit of an age where people scream at folks of another religion to “go back to your own damn country” even when they are second or third generation Americans? How do I respond to the spirit of an age which seeks to drive LGBTQI people into the shadows once more? Shadows in which they are ignored, beaten, and/or abused. How do I respond to the spirit of an age which says generationally inherited wealth is enough of a qualification to usher you into the presidency of the last, great superpower on the planet? But most of all, how do I respond to a spirit of an age where people take it as common wisdom that all they should worry about is “getting what’s mine!”? Well, I will respond as I have always done. I will proclaim the Good News of Jesus Christ which says, “All are welcome at the table. I ate with Judas and I’ll eat with you.” Immigrants are welcome, people of other religions are welcome, LGBTQI people are welcome…..and even Donald J. Trump is welcome. I don’t care what walls get built, I’m going to come along with the wrecking ball of the Gospel and do my best to knock them down. I recently came across a question in a Christian group on Facebook which asked, “What is the difference between fairness and justice?” I thought about it and want to answer this question from a pop culture and geek perspective while throwing in my own Christian perspective. Please note I’m not directly addressing this topic with the more academic and theological defintions of justice. While they inform my thoughts, I want to address these words from how I have seen them play out in the real world. Fairness is a concept we often find on the ball field and in a variety of sports. “Fair play” is usually centered around the idea one should make everything as equal as possible to ensure people have the same chance in a given activity. You see it in golf when the better opponent willingly takes a handicap before the game begins. You also see it in chess when a master grants you extra moves or plays without an essential piece or two. Fairness, at its heart, is about making everything more enjoyable for all. The chess master or golf pro is challenged when they take a handicap and the person playing against them has a better chance of winning. This makes the game more enjoyable for both parties and they both have an opportunity to improve their skills. 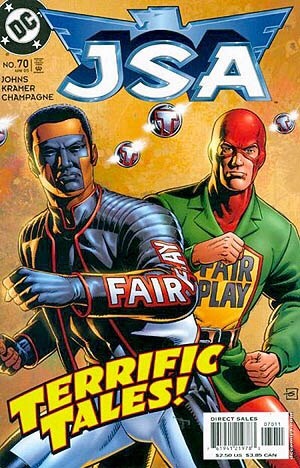 Fair Play is also something seen in the comic book character Mister Terrific. Both incarnations of the character, Terry Sloane and Michael Holt, are men with amazing intelligence and physical abilities. Their concept of Fair Play is rooted in taking up the mantle of helping those less fortunate than themselves. Sloane’s character even started “The Fair Play Club” to help young people held back by juvenile delinquency. As for Justice, in popular culture, there are two views which people often argue over and can’t seem to get on the same page. This occurs, in my opinion, because of the propensity in our culture of believing one’s own view is the only correct view. The first view of justice involves retribution. If you have done something wrong, then you must pay for your crimes and/or mistakes in one way or another. You deserve to be punished for your wrong doing and justice demands it. This is seen in TV shows and movies quite a bit. The Punisher and Daredevil are two popular examples. The other example in our culture is social justice. This is sometimes referred to as restorative justice. Those who have been injured by society and kept from its most basic resources should have these needs restored. Justice demands restoration! In these examples, then, fairness is similar to social/restorative justice. The problem we face is when people don’t think it’s “fair” when someone they believe should experience retributive justice instead receives restorative justice. The young man who kills someone through an act of cruelty and violence should be punished yet the court system finds out the details of his childhood and places him in a program to help him overcome a horrible childhood and then returns to his community to lead others out of this downward spiral is a great story….except for the family of the original victim. They still want to see retribution. Notice then, in my definitions, fairness can only occur (and by implication restorative justice) when one in the position of power willingly handicaps them-self to give the one in a lesser position a hand up. In the example above, those in society who are judging the young man have handicapped society (power) by willingly paying to make sure this young killer is restored to a place where he can bring about life. Retributive justice, as has been seen in the Scriptures and we see in the world, occurs when those in power feel they have been wronged. (Nebuchadnezzar and the three Hebrews. Jesus, the Temple leaders, and the Imperial state.) The powerful cannot stand to be challenged therefore they pour out retribution on those who they see as challenging their authority. Interestingly, in popular culture, retributive justice is seen in a very different way. Characters such as The Punisher and Daredevil become agents of retribution for the weak and powerless. This is a fairly modern concept though we can look back at stories of Robin Hood, “stealing from the rich and giving to the poor” as part of this development. It is at this strange crossroads the Christian then must examine them self and the Scriptures while seeking a way forward. The difficult part is our sense of fairness! Those who are weak often wish to forcibly handicap those in power. In doing this, the powerful will receive retribution for both perceived and real abuses while the weak believe themselves to be receiving restoration. The Christian story, however, does not advocate this path. It calls the powerful to willingly handicap themselves. They must set aside their authority and privilege and become a servant. The weak are called to turn the story upside down and to see their very powerlessness is what makes them strong. The disconnect comes when either one or both parties does not embrace their path. Powerful people who refuse to handicap themselves become autocrats and dictators. Weak people who refuse to see the power inherent in weakness can become abusers to those within their limited sphere of influence. Life Hacking, according to Wikipedia, “refers to any trick, shortcut, skill, or novelty method that increases productivity and efficiency, in all walks of life” and I believe that is a pretty good way of explaining it. Over the next few weeks I will be talking about the spiritual disciplines and how we can go about “Life Hacking” them. When referring to the spiritual disciplines, I will be specifically talking about prayer, public worship, fasting, and the Scriptures. Now, considering I am a part of a tradition that puts a stress on the word discipline, some people may take exception at the idea of Life Hacking these disciplines. For at least the last 40+ years I have seen many “novel” and “tricky” ways to approach prayer and the other spiritual disciplines and the majority of them come across as what I refer to as cotton candy spirituality. Cotton candy spirituality tastes really sweet and is fun to look at but, if you eat too much of it, your teeth begin to rot out and you will get sick. This is not what I am advocating! In looking at Life Hacking, one of the things I’ve noticed in the majority of videos and articles I have read is that there is a certain amount of things one already needs to have on hand. Most life hackers take things from there surrounding lives and repurpose them and this takes skill, time, and determination. In this series, this is what I hope to do. It is my desire to help others look at the things surrounding them, things already present in their own lives, and guide them into better, more relevant ways to practice these spiritual disciplines. Like most of my sermons, I have to admit I am a work in progress. As I look into these “Life Hacks”, I will be journeying along with everyone else and trying find ways to improve my own spiritual life. And, one final note. I am asked quite a bit whether or not these messages will be recorded. Unfortunately, I currently do not have the staff to make sure this happens so the best way you could journey with us in these Life Hacks is to come to Trenton First United Methodist Church in Trenton, TN. Hopefully, in the future, I will be able to post sermons such as this online. In the world of social media, we are taught to put our best face forward at all times. Sadly, this gives an unbalanced view of life and the world. We post our most clever photos, our newest clothing, and our greatest achievements. When we do this, we give the world the view that our lives are perfect and grand. The world does not see that it took us 20 tries to get that pic exactly right. It doesn’t realize those new jeans were put on a credit card and we aren’t sure how we will pay for it. It also doesn’t see all the failures we had before we unlocked that great achievement. On the flip side, there are those who use social media to air all the darkness and pain in their lives. For those of us who read them, we see a life of spiraling horror. The looming abyss seems to always be grasping at them. Christ is a man acquainted with grief and sorrow, at the wedding in Cana He was in the midst of joy and celebration. The Christ follower is called to live a transparent life that shares both the highs and the lows. This life of transparency to which we are called is a difficult one but one which Jesus lived. Jesus laughed and Jesus wept. Let us learn to share the reality of life with all that we meet and, in that sharing, may they meet Jesus. I remember the first time I really began to like werewolves. I was 13 years old and bought my first real “Do It Yourself” Halloween costume. It was the kind that had latex, paint, spirit glue, and lots of other accessories. I worked pretty hard on it and wore it to my High School’s Halloween carnival. What made me really like this costume was it was the first costume I’d ever worn in which no one recognized me. I could act gruff, foolish, silly, and a little bit odd (you know, me acting NORMAL) and no one seemed to recognize me. At the heart of it, this is what I think being a werewolf can be about: Transforming into a creature no one recognizes so you can either act differently from your “proper” self while giving into your more bestial nature. In preparing for this message, I decided I needed to watch a wide variety of television shows which featured werewolves since this is what seems to be the best place to find this rather popular creature. Shows such as Wolf Blood, The Originals, and a variety of others were poured over. I also took time to make sure I watched and rewatched a few werewolf movies. Movies such as An American Werewolf in London, Curse, and, of course, the original The Wolfman starring Lon Chaney were viewed with a great amount of pleasure. As an aside, I sometimes think An American Werewolf in London may have been the one I first saw. I still remember seeing it as a young man and the story and special effects sticking with me to this day. Out of all the movies, though, I found myself returning to the original black and white with Lon Chaney. Why? Because the spirituality in the movie was so clear and religion and superstition were not avoided. In other movies, these things might be mentioned but they were often avoided or, at times, made out to be a joke. In the original, these themes just seemed so natural. So, you’re going to need a little background of The Wolfman movie in case you’ve never seen it. Lawrence “Larry” Talbot returns home to England from America after the death of his older brother to help his father, Sir Jon Talbot, with the family estate. During the process of killing a werewolf who is attacking a young lady, he finds himself bit and later becomes a werewolf himself. Larry struggles with turning into a beast and finds himself rampaging through the countryside killing innocent villagers. He is eventually killed by a silver cane he had purchased earlier in the movie…a can wielded by his father, Sir Jon. And this is the heart of what we, as Methodists, call Wesleyan Theology. A diseased soul versus a depraved soul. This is the struggle faced by King Nebuchadnezzar. This king, in the very first chapter of Daniel, is said to have been given victory over Daniel’s people by God. All of Nebuchadnezzar’s kingdom is a gift from God and, if we look hard enough, we can see some of the good things which this King does. However, there is also the evil within Nebuchadnezzar’s own soul. There is a pride and arrogance that continues to plague him time and time again. There are times when he requires all the people to worship him as a sign of their loyalty and, when three of Daniel’s compatriots do not do it, he throws them in a fiery furnace from which they are delivered by God. Still Nebuchadnezzar sees himself as the source from which all his success comes and ultimately has a dream from God telling this King if he doesn’t recognize the source of his success he will turn into a beast. This is the story we have just read…Nebuchadnezzar becomes a beast. Isn’t this a story that speaks to our world today? The American dream (myth) is about how we are a self-made people. How we supposedly succeeded without help from any other person and made our own way in the world. In one way or another we try and take the credit and it’s especially true for those who may not have had supportive family members. We have heard this type of talk many times and our culture has made an idol of the person who seemingly succeeds with no help from others. However, at the end of the day, there is a God who says all of our success is rooted and grounded in His very being. This God is the source of all goodness and mercy which surrounds us. We Wesleyans call this prevenient grace and we can find the beginnings of redemption in it. The beast within, The Wolfman if you will, comes out when we live a life without acknowledging something or someone greater than ourselves. I would says this even applies to those who may or may not believe in God. Along the way all of us have experienced help in one form or another. Maybe it was a parent, a friend, a teacher, or a relative who encouraged us to succeed. Maybe it was a scholarship or a government grant which helped us attain an education which would have otherwise been unattainable. Maybe it was that first chance someone took on us to give us a job even though there didn’t seem to be anything special about us at the time. Somewhere, somehow, along the way, we have been gifted with help and, just like Nebuchadnezzar, we are called to acknowledge it. I would say, of course, as a follower of Christ we are called to take things one step further. We should give thanks and honor to God for each and every chance we have had in life. Those times of success and failure are gifts from the Creator to form us into Christ’s image and make us something more. They call us into a life of covenant with each other and with the One who has made us. And speaking of covenant/relationship/commitment to one another, I want us to take a moment and return to our Gospel story from Mark 5. In it we heard about a man who was possessed with an evil spirit. Isn’t that like a werewolf? Some beast inside trying to claw its way out causing pain and destruction all around it? In the movies I’ve seen and all the books I’ve read over the years, being a werewolf is looked upon as a curse from which to be delivered. Sadly, in the majority of the movies I’ve seen, the only cure for that curse comes through the death of the person infected with this lycanthropy. However, as we’ve seen in the story of Nebuchadnezzar, after his time of punishment for his pride there comes repentance and deliverance. In this story from Mark’s Gospel, we see that an encounter with Jesus brings healing from the monster which had invaded a man’s soul. Isn’t that salvation? A wholeness making us better than we were before? A deliverance from the demons within and the chains which have been holding us in the graveyard of life? Isn’t salvation Christ leading and directing us from the place of destruction and evil to a place of mercy and healing? Unfortunately, in this Gospel story from Mark, the people around this demon possessed man saw everything in black and white. They were not willing to see another side. These people in Gerasa thought they had the world figured out. This man was demon possessed so they let him run amok day and night. Oh, they tried to chain him up but, beyond that, it doesn’t seem like they cared for him very much. He was causing problems so he had to be put out of sight and out of mind. This is the same way I viewed Larry Talbot in The Wolfman. Here is a troubled soul and many people in the community wanted to put him away. They didn’t embrace him or care for him. He was different. He didn’t seem a part of their community because he had been gone so long they had not desire for covenant/commitment to him. This reality was ever so true when Larry, feeling the weight of his guilt and pain while struggling with the beast within, walks into the church and sees everyone staring at him. He is made to feel so uncomfortable that he doesn’t stay for the service and turns and walks out. Yet isn’t the church the best place for someone struggling with the beast within? Shouldn’t the church be the place of love and grace where a person struggling with the pain of sin and the struggles of a fearful world would find a few moments of peace and acceptance? Sadly, we look at the werewolves of our culture, the strange “beasts” and keep them away from the one place where they should be finding hope and acceptance…and this is The Theology of Werewolves. The beast is shunned and hurt. Hidden away among the tombs of this world and never given an opportunity for healing. But where does this beast come from? In the movie, Larry Talbot is a tragic figure because he becomes a werewolf through no evil of his own. Unlike Nebuchadnezzar whose pride strikes him low, Larry is a perfect example of the old phrase “No good deed going unpunished.” He becomes The Wolf Man simply because he wanted to rescue someone from being hurt. Sin scratches at the door of each and everyone of us and it is through no fault of our own. It is just the way of the world. What, then, is the solution? Do we stop doing good? Do we just drift to the side? Do we avoid as much as we can so as to keep ourselves safe? This is how holiness has been defined for so very long. Avoid the world. Avoid sin. Avoid anything that might have the semblance of the monstrous about it. Yet, this is not the way Jesus is…Jesus comes across this man filled with demons…filled with beasts…and Jesus grants him hope, freedom, and healing. Then this Jesus does the unthinkable. He casts those demons into a bunch of swine who run off a cliff. And then all the people celebrate because their friend is now in his right mind? They throw a party because the prodigal has come home, right? No. No. No. Instead they’re afraid, angry, and upset. Why? Why would they be so angry? Well, Jesus just cost them a lot of money. These people were Gentiles, obviously, because they raised and ate swine. Now, I don’t know about you but I tend to eat pork quite a bit. Every where I turn there is pork for sale. Why? Because it’s easy to raise, easy to sell, and easy to cook. It was the same way in Jesus’ world. Jesus, in healing this man, just hit these people in their own pockets so He might bring healing to what they saw as an undeserving monster. So, the question of the day is, “How will we react when Jesus does something amazing to the beasts within our own hearts? Are we willing to pay the price?” I believe most people would say, “Yes” they are are willing to pay the price of time, money, and effort when it involves ourselves and possibly a close family member. However, are we willing to pay the price when it involves those beasts “out there?” Those monsters lurking in the graveyards of the world around us? Are we willing to put in the money, time, and effort to see Jesus heal the outsider, the stranger, the beast roaming the tombs of this world? It is a costly thing to follow this Jesus and it’s even more costly when we see Him working in the lives of others. When following this Jesus, we pay the ultimate price when we willingly give up our lives for others. “No greater love has a person than this, than to lay down their lives for their friends…” but isn’t the greatest love of all to lay down our lives for our enemies? To destroy the curse of the werewolf we need Jesus. We need the one who has the power to grant the request of healing so needed within our souls and the souls of those around us. We just need to make sure it doesn’t cause us to run this Jesus off when the price of it hits too close to home. At the end of the day, we need the help of heaven right here and right now…and that help is found in the person and reality of the Living Lord Jesus. Would you believe? Would you be healed? Come to this Jesus. Come…come to this Jesus and find blessed assurance…find a foretaste of that glory divine.